The British Foreign Office showed appalling judgement when scheduling a visit by Prince William to a refugee camp in the West Bank which should have been closed down long ago. Jalazon had not been dismantled during the past 25 years after it came under Palestine Liberation Organisation (PLO) control. Jalazon’s inhabitants should still be classified as “refugees” when they are living in part of former Palestine now under PLO occupation. Prince William’s visit was closely followed by a meeting between Palestinian President Mahmoud Abbas and United Nations (UN) Special Coordinator for the Middle East Peace Process – Nickolay Mladenov. During their meeting – Abbas stressedthe UN’s important role in providing protection for the “Palestinian people” and the necessity of continuing to provide services to the “Palestinian refugees” through the United Nations Relief and Works Agency (UNRWA). Gaza has 1.3 millionregistered “refugees” – of who 500000currently live in 8 refugee camps. As in the West Bank – UNRWA does not administer or police these camps -this being the responsibility of the “host authority” – Hamas. Closing these refugee camps and integrating their long-suffering populations among the general population are long overdue. The failure of the PLO and Hamas to do so allows them to maintain and exploit a hard-core of hate-filled and desperate Palestinian Arabs who can be readily incited and used as pawns and martyrs to undertake acts of terrorism against Israel. 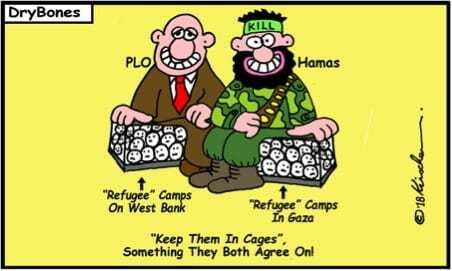 Entrenching apartheid by segregation and discrimination whilst denying equal rights to all members of the Arab populations in Gaza and the West Bank spells disasterfor both Hamas and the PLO.